These enormous, insanely-detailed Halo figures (which we caught a glimpse of a few months ago) from ThreeA don't have an asking price. They're like a luxury car, or a designer watch. If you need to ask how much, you probably can't afford it. If you could, though, boy. If these aren't the best video game action figures I've ever seen they must be damn close. Standing 13.5 inches tall, thy come with fiber optic lighting, magnetised armour (so the metal weapons can attach to them), multiple weapons and enough articulation that you can even wiggle their little fingers. 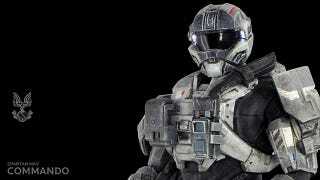 There are two figures due, one of Halo: Reach's Commander Carter and one of a Spartan MKV, and they'll go on sale next week at threeA's online store.